In my last post I mentioned that Raymond Leo Cardinal Burke, Archbishop Emeritus of the Archdiocese of Saint Louis celebrated mass last Sunday at our Cathedral Basilica. I hoped that the text of his homily would be posted on line, and it has been. You can read it here. In case you aren’t familiar with Cardinal Burke, he was Archbishop of Saint Louis until last June when the Holy Father appointed him Prefect of the Signatura in Rome. Then in November, he was elevated to the College of Cardinals. He was in Saint Louis this week to celebrate a mass of thanksgiving on Sunday and to participate in the Ordination of Monsignor Edward Rice as auxiliary Bishop. Receiving new and weightier responsibilities in the Church, my thoughts have turned naturally and gratefully to the gift of having served as your archbishop. My life in the Church and whatever service I have been and am able to give to the Church has been immeasurably blessed by the faithful of the Archdiocese of Saint Louis and by the years I served you. I do not forget you and the great blessings which have come to me in the Archdiocese of Saint Louis. When I was appointed Prefect of the Supreme Tribunal of the Apostolic Signatura, I was particularly grateful that the Holy Father had given me the title of Archbishop Emeritus of Saint Louis. I treasure my continued relationship with the Archdiocese. I found the Cardinal’s words particularly relevant because I’ve been appointed by our current Archbishop to new and weightier responsibilities in the Church. Beginning this Monday I will assume a new position, Director of Saint John Nepomuk Chapel. Like Cardinal Burke, I am very grateful for all the blessings I have received at my previous assignment at Saint Bernadette Church. Also like Cardinal Burke, my boss, the Archbishop of Saint Louis, has allowed me to retain my ties to my former parish as well. I’ll continue to serve the parishioners at Saint Bernadette by celebrating a morning communion service twice each week and perform some other duties as well. I have a plethora of friends at Saint Bernadette including many who have allowed me to participate in some of the pivotal moments of their lives; baptisms, weddings, and yes, even funerals of loved ones. I’ll miss these people dearly. But, I was ordained to serve the Archbishop and to go wherever he needs me. Now he’s called me to a unique ministry. Saint John Nepomuk is a church community that dates back almost until the Civil War. Like a lot of inner city churches, many of its members have migrated to the suburbs. Nowadays, it’s a chapel rather than a parish, meaning that it has no geographical boundaries. People come from all over the metropolitan area to attend mass there, many because of their Czech heritage. Attendance has dwindled and when the most recent pastor retired, the Archbishop made the decision not to assign another priest. 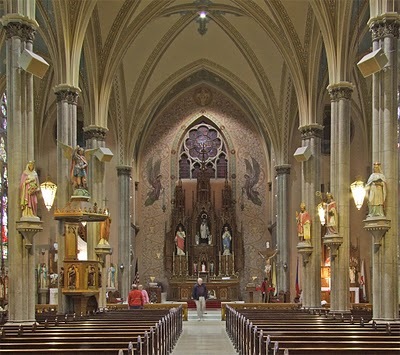 My role will be to run the physical plant, find priests to celebrate mass on the weekends, and to provide for the spiritual needs of the community. 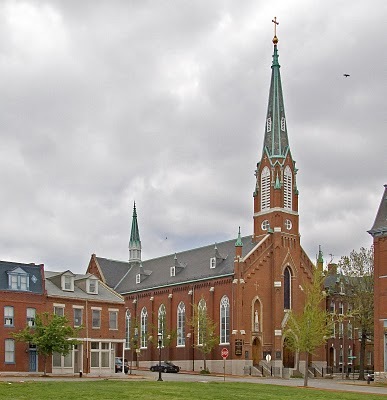 Saint John is the only parish in Saint Louis to use this model. With God’s help, the church’s members and I will make this work and possibly open the doors for others to do the same. So, while I’m sorry to leave the comfort of Saint Bernadette, I realize that I wasn’t ordained to be comfortable. Like Cardinal Burke, I look forward to the challenge and look forward to my continued association with Saint Bernadette parish, too. God never calls us to do anything without giving us the tools we need to succeed. This last sentence has always struck me as odd. It seems to imply that Jesus healed the lady so she could wait on Him. But I don’t think so. I prefer to think that she waited on Jesus and His friends out of gratitude. You’ll have to make up your own mind on that one. Feel free to insert your favorite mother-in-law joke, if you like. Aparantly the word got out about Jesus being in town because at sunset everyone who was ill or possessed by demons showed up. He cured the sick and drove out the demons. Sometimes that means we have to step out of our comfort zones. Sometimes we have to take a chance, even though it means new, unfamiliar challenges. Jesus was called to preach to all the people, not just a few. The same goes for you and me. On Sunday, Raymond Leo Cardinal Burke was in Saint Louis for a mass celebrating his entry into the College of Cardinals. He gave a very inspiring homily on the subject of taking on greater challenges within the Church. Hopefully the text of the homily will be available on line later this week. If it is, I’ll post a link to it here. He pointed out that everything that has gone before in his life has prepared him for his new role in the Church. We can all learn from what the Cardinal said. Everything God has shown you, taught you, given you in the past is preparation for what lies ahead. Who doesn’t want to hear those words spoken about themselves. Some of us live our entire lives without ever hearing these words. Some of us have heard them often. A lot of us will never hear them again. But it must have made Jesus happy to hear the words from His Heavenly Father. Of course God is a good father, both to Jesus and to you and me. Those of us who are human parents can use God as a role model, but we may not always measure up. As I was going over today’s readings I thought about how seldom I praise my own kids, even though no father could be prouder of his children than I am of mine. If praise makes you and I feel good, I have to think it makes God happy too. God doesn’t need our praise. He’s surrounded with angels who sing His praises all day long. He’s God. He doesn’t need us at all. But He loves us and getting props from the people we love makes everyone feel good. If God is love, then us loving Him back must make His day. So, here we are. It’s Sunday morning and we’re gathered in this church to give praise to God. That is why we’re here, isn’t it? “It is right to give Him thanks and praise.” But let’s be honest. Sometimes we all come up a little short in the thanks and praise department. We begin the mass by asking God to put us in the proper frame of mind to be in His presence. We ask Him for His mercy….three times. Then Father asks Him to forgive us our sins and bring us to everlasting life. What comes next? After the homily, we praise God again in the Creed. “We believe in one God!” We should say it with a lot of enthusiasm because we’re explaining why we believe. It’s not the time to mumble, or worse, to remain silent. Then we move on to the Liturgy of the Eucharist. The word “Eucharist” means “thanksgiving” and we begin with Father blessing God and we respond “May the Lord accept the sacrifice at your hands, for the praise and glory of His name.” Next we lift up our hearts to the Lord and say “it is right to give him thanks and praise.” There’s that word again. Praise. Following the Eucharistic prayer, we pray the prayer that Jesus taught us, the prayer that begins “Our Father who art in heaven, hallowed be thy name!” The word “hallowed” means holy, sacred, or revered. All this praise of God leads up to the high point of the mass, the reception of the body and blood of Christ. Father elevates the Body of Christ, I elevate the Blood of Christ, and all of us proclaim that God is so great that we don’t deserve to receive Him, but that through His word, our souls will be healed. From beginning to end, the mass is all about praising God. He’s not just our reason for being here, He’s our reason for being. He deserves our thanks and praise. But do we mean what we say? Believe me, I’m including myself when I say that we often go about the mass in a half-hearted way. We’re here to receive the greatest miracle of all, the Body and Blood of Christ, in the form of bread and wine. It’s not symbolic. It’s not an empty ritual, and it’s not routine. It’s miraculous. It’s magical. And I don’t mean in some cheesy card trick magic kind of way. It’s a gift that Jesus left us when He returned to heaven. It’s as real as you and I are. Now, if I was smart, I might just shut up now and go sit down. But, I have to tell you something. Frankly, some of you guys don’t always look like you’re here to praise God, or to receive His Body and Blood. No offense, but I look at this crowd and see some faces that seem bored, some that seem like they’d rather be some place else, some that even seem angry. Some of you come to communion looking like you’re standing in line at the DMV. I get it. We all have bad days. That’s understandable. But what we have here, in this Church, in this parish, is the REAL PRESENCE OF JESUS CHRIST! I think sometimes we forget that. So, do me a favor. As you approach the altar today to receive Holy Communion, think about what we’re doing here. Think about the sacrifice Christ made for us and think about the gift you’re about to receive. Then, go back to your seat, get on your knees, and think about what’s just happened. I know many of you already do this, so you guys just keep it up. But if you’re one who’s gotten complacent about the mass, if you think it’s boring, I promise you that if you do this one thing, then do it again next week and the week after that, you’ll be amazed at the results. Remember, it IS right to give Him thanks and praise. Just a short post today on the topic of discernment. To paraphrase Father Thomas Merton, God never gives us the whole answer. He reveals the truth to us in pieces, but the sum of the pieces never equals the whole because, if He told us exactly what He wants us to do, we would have no free will. If we knew with 100% certainty that God wanted us to do a thing, we would have to do it. After all, who can refuse God? For Christ does not give a mission without supplying the means to accomplish it. Subtle, huh? That pretty much does away with my last concern. I have to say that God has always provided me with enough rope to hang myself but He’s also always given me a pair of sharp scissors to cut the rope. I’ll tell you more about my decision in a few days, but for now, I’ll just say that God speaks to all of us on a regular basis. The problem is that we don’t always listen.